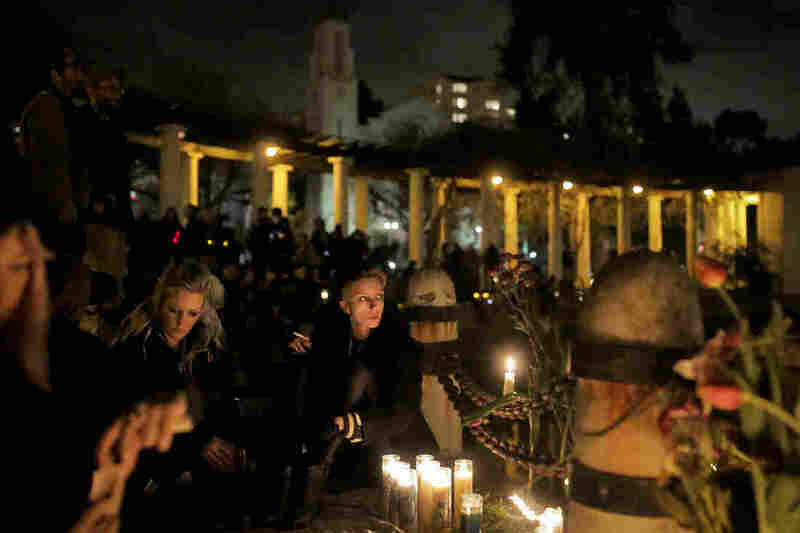 Deadly Fire In Oakland May Spur Crackdown On Off-The-Grid Artists' Spaces Rents in the Bay Area are among the highest in the country, pushing many artists into illegal work/live spaces like the Ghost Ship, where a fire left 36 dead. Now, officials vow to step up regulation. 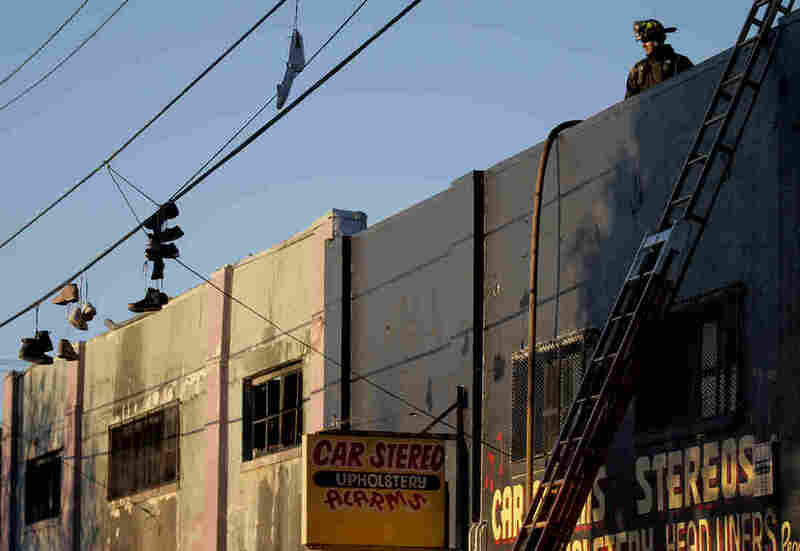 Smoke hung in the air for days in Oakland's largely Latino Fruitvale district after a deadly fire broke out late Friday night in an artists' warehouse, leaving 36 people dead. Like so much of the city, it's a neighborhood facing ripples of gentrification created by the tech boom in the Bay Area, which now has some of the highest rents in the country. Carmen Brito lived in the now destroyed warehouse known as the Ghost Ship. She barely got out with her life. "You can go three blocks, and you can see rows of tents of people who are homeless, and nobody wants to talk about that. Nobody wants to talk about the people who've been forced further and further out," Brito says. "San Francisco can't house artists anymore, because it's so expensive. And they're asking us, why did you live this way? What other choice did we have?" But the story of artists' warehouses in Oakland is more complicated, according to Adam Hatch. He's run off-the-grid spaces like the Ghost Ship for years. "The housing crisis did not kill these people," he says. "A lack of responsibility and oversight killed these people." And Hatch says artists, queer and trans people, those on the margins, gravitate toward these outsider housing situations by choice. "We were in those spaces in the late '90s and the 2000s," he says. Even though the spaces may not be legal, Hatch says they don't have to be dangerous. He says it's a beautiful, creative world — part of what makes Oakland special. But already, city officials like Councilman Noel Gallo — in whose district the Ghost Ship was located — are talking about cracking down. "We recognize that we should have been more assertive in the past. We've talked about it," he says. "But now we'll expedite that action." On Saturday, firefighters investigate the scene of the overnight fire at the Ghost Ship warehouse in the Fruitvale neighborhood of Oakland. The city says it wants to be friendly to artists, but also to prevent dangerous living conditions. That sentiment has left residents of these live/work spaces in Oakland united not just in grief, but also in anxiety and fear about being displaced. That includes people like Darren, who lives in a cavernous warehouse not far from the Ghost Ship. He asked that we not use his last name because he's living there illegally, and fears being evicted. "And they're going to twist what you say into something that's gonna make it more difficult for us to stay in these spaces. ... It could lead to a crackdown on these spaces," he says. The victims of the Ghost Ship fire have been made into scapegoats, Darren says, as if in living in a warehouse made them complicit in their own deaths. Darren has lived here for 20 years. And in that time, there have been two fires. No one was hurt, and they didn't spread. "Somebody had candles, and there was a candelabra, and they fell asleep and they probably had tapestries and things like that on the wall — which you'll notice there's none of that kind of stuff here," he says. There's also a new sprinkler system, industrial-size pipes — better than those in an average apartment building — in every corner, even in the tiny bathroom off Darren's bedroom. "So every single space, they managed to get a sprinkler into the space. Which is quite impressive," Darren says. And these safety measures caused rent to rise — but only slightly. Darren says that shows these spaces can be made safe from fire. But for residents here, after the Ghost Ship, they don't feel safe from being kicked out.